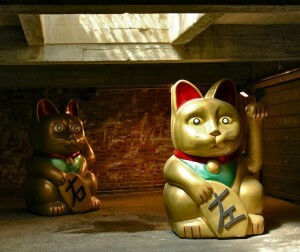 The Fortune Cats use superstition based idols as an investigation of an individual’s interaction with the “other”. It takes the questions we ask of ourselves and the universe and gives them form. This conversation is conducted between the viewer and the cats via gold telephones. Cat deities are historically dualistic and this division is echoed by encouraging the viewer to choose a path to one cat or the other. Whilst the piece has it both ways: a search for money and for answers being brought to the same icon, it insists that while the (fat) cats have both, we will probably end up with neither. The Fortune Cats were originally commissioned by Brighton & Hove Council as the centrepoint to The White Night Festival in 2009. In 2010 we took the cats to Amiens, France for Nuitsblanche.